A terrifying psychological horror game inspired by the developer's battle with mental illness. Explore nightmares! Branching narrative! 3,608 backers pledged $106,722 to help bring this project to life. If you missed out on the kickstarter, fear not! You can still support our development by backing on our website. We accept paypal! We are now releasing SIMULTANEOUSLY on Windows, Mac, Linux, and Ouya! The demo is Windows only, but the game will be available on Windows, Mac, Linux, and Ouya. We've updated the demo (on 9/5/13) with wider graphics card support. If you are still having trouble running it, message me! Update 19 - Simultaneous PC, Mac, Linux, and Ouya release! Update 15 - Greetings from China! Update 9 - Haunted Houses and Backer Meetup! Update 7 - Why Kickstarter? Update 2 - Why am I Making This Game? Update 1 - Exciting Progress! Joystiq did a video preview. 9/23/2013 Update: We are now offering add-ons! These are some interesting rewards you can purchase. In order to purchase them, change the amount of money you are pledging to account for the purchase price of the add-ons you want, but don't change your reward tier. We will send a survey asking what add-ons you want at the end of the campaign. You can only purchase add-ons with the difference between your reward tier and your actual pledge amount. If you have any questions, feel free to message me. $10 – Inner Circle Videos: These are available in the $50 tier, but now you can get them a la carte. $10 – Digital Art Book: Also only available in the $50 tier, you can now order it by itself. $10 – Additional copies of the game: As a thank you for supporting us, we are making extra copies of the game available at a discount. They make wonderful gifts for friends! You need to purchase the game first at $15 (or $10 if a spot opens up in the early bird tier) to take advantage of this. Sorry, no shortcuts! $15 - Developers’ commentary: Listen to Matt Gilgenbach talk through a video playthrough of the game while explaining where the ideas and inspiration for the game came from. This Add-On is not offered in any reward tier. $20 – Designer’s Notebook: Are you interested in how the ideas of Neverending Nightmares took shape? The designer’s notebook will be an ebook that features all the documents Matt made during the process of designing the game. It will have Matt’s notes from a nightmare he had back in 2005 that was a big inspiration for the project as well as design docs for other game ideas that merged into Neverending Nightmares. It features Matt’s brainstorming notes where he put down everything scary and interesting he could think of for the project. If you are interested in learning about how the game took shape, this reward is for you! I would share some examples of what will appear here, but they are pretty spoiler heavy. :) This Add-On is not offered in any reward tier. $25 – Matt Gilgenbach’s unreleased novel: Previously only available at the $75 tier, you can now get the ebook by itself. Neverending Nightmares is a psychological horror game inspired by the real horror of my battle with obsessive-compulsive disorder and depression. It features a truly interactive narrative structure allowing you to shape the outcome of the game. It will take the psychological horror genre in a new direction by eschewing many traditions that don’t contribute to creating an immersive horrifying experience such as limited save points, item collection/ammo hoarding, and puzzle solving. The gameplay focus is on exploration. Horror is amplified by vulnerability, so you won't be picking up guns and shooting monsters. While there may be some very light combat mechanics, you will have to work to avoid confrontation. In the demo above, we focused on proving exploring a mansion could be scary, but we plan on developing more gameplay systems. Stealth will play a big part of the game. However, we don't plan on having a bunch of complicated stealth systems because we feel that they would steal your concentration from being immersed in a horrifying world. Instead, we are planning something more along the lines of Amnesia: The Dark Descent where enemies are invulnerable, and you must hide to survive. Stealth games are often extremely unforgiving. We want to make a game that is accessible and fun for a wide variety of skill levels. In Neverending Nightmares, the punishment for death is that you either wake up in the same nightmare (like a checkpoint) or "dying" will transport you to a different branch in our narrative than if you had succeeded. My goal when designing indie games is to make sure they would work on an NES controller. It is a great litmus test for the control complexity. To keep things simple, we want to make the interact button do as many context sensitive actions as it can. Presently, it handles opening doors, picking up, and using items, but we plan to use it for more actions like hiding. We are experimenting with adding a run button. However, we want to prevent the situation where you are always running. If you were in a haunted house, would you run all the time? I definitely wouldn't. We are currently thinking of ways to have running serve a gameplay purpose but not be something the player will always do. The game features a unique art style influenced by the famous illustrator Edward Gorey and uses color to emphasize interactive objects. Blood also appears in red in order to emphasize the gruesome violence. While the art style is 2D, we are using advanced 3D graphics techniques to create the stylized look. Light and dark is extremely important to creating a horror game, so we spent a lot of time building out technology to give it a unique look. We created a pixel shader that renders the hand-drawn shading based on the dynamic lighting values. The shading effect is animated creating an eerie feel. The player has raytraced shadows. For light coming in through the windows (like you see above), we project light frustums in 3D. The light projects on the player and he blocks the pattern on the ground. All of these details really give the darkness character and make it feel more oppressive, which in turn amplifies the horror of the game. The game features a unique narrative structure where you keep waking up inside another nightmare. This allows us to redefine reality every time you wake up. Players will experience the mind-bending challenge of having to determine what is real and what is just a nightmarish manifestation of the main character's psychological state. In a nightmare, there will be different options of how to complete them. Depending on what you do, when you wake up, it'll be into a different nightmare and the narrative will branch. Most games' branches converge back on the same story line quickly. In Neverending Nightmares, we keep the narrative branches alive, and they lead to several completely different endings that dramatically change the reality the main character will be waking up into. Since the game is designed for multiple playthroughs, a single playthrough will be relatively short - probably between 1-3 hours. Keeping the tension high in a horror game is challenging, and we don't want to put in filler to pad out the game length. However, you won't understand the full meaning of the game until you play through all the different paths and achieve all the endings. We expect the average player to play through between 4-6 times, but there will be even more content for those who want to thoroughly explore the world of Neverending Nightmares and experience every possible outcome. The game is heavily influenced by Silent Hill (especially 2) because in that series, all the horrific images have meaning and reveal more about the characters. The developers masterfully tell a story through the subtext and horrific incarnations of creatures that occupy the otherworld. 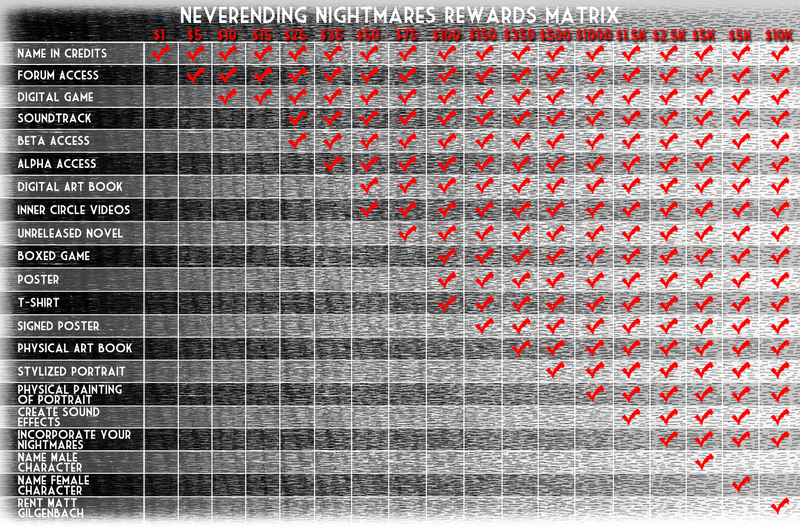 This is one of the main goals of Neverending Nightmares. Every aspect of the game reveals more about the psychological state of the main character, Adam, and ties back to the idea of creating the feelings I've struggled with as someone with mental illness. Amnesia: The Dark Descent is another influence. It's a very scary game with a streamlined and much more modern feel than other recent horror games. There are no clunky combat systems or complex inventory management. It just focuses on the horror! We plan on doing the same. Neverending Nightmares is semi-autobiographical, so let me tell you a little bit more about myself. As mentioned above, I suffer from obsessive-compulsive disorder and depression. My problems were at their worst from 2001-2003, and I suffered greatly. When I moved to Los Angeles to start my career as a game developer, I was very fortunate to get therapy that gave me the tools to cope with my mental illnesses. In 2008, I co-founded 24 Caret Games and began working on the indie game Retro/Grade. The game's scope spiraled out of control and my obsessive-compulsive disorder took control of my life. I worked constantly and became quite miserable. If you are interested in learning more about the development of Retro/Grade, check out my GDC talk. Despite getting positive reviews and awards, Retro/Grade was a failure financially. After all the time and money I invested in the game, I took it quite hard and began a downward spiral into depression again. The memories of my hellish battle with mental illness a decade ago seemed like a vague memory, but they came flooding back after Retro/Grade failed. I felt lost and didn't know what to do. More than anything I wanted to remain an indie developer. I decided I would try one last project to make my "dream" game. I wanted to create something personal, important, and would create a positive impact. That's where the ideas for Neverending Nightmares came from. I hope to help people who are struggling with mental illness. If I can help at least one person, it would justify all the suffering I've endured. It would give meaning to all the horrible things I went through, and that would make my pain worthwhile. I strongly believe that through the game and the developer diaries talking about my battle with mental illness, I can really make a difference in peoples' lives. I can show them that they are not suffering alone! I can tell them that things can get better. People have already written to me about how I've inspired them, but I want to reach out to a larger audience and help more people! I need your help to do that. If you like what I'm trying to accomplish, please back the project and help me continue on my mission to make terrifying games AND talking honestly about mental illness. We want your feedback on the game! We want you to participate in discussions with the developers. We want your advice on difficult design decisions that the team is stuck on. By funding the game, you join our community that will help build the game, and your contributions will be recognized in the game credits (even if all you do is back the project). In addition, we will have an exclusive backer videos talking more in depth about the development of the project. There will be exclusive backer forums for full discussion with developers and other backers to help guide the game direction. We also plan to release first look shots and videos to backers too. We're participating in OUYA's #FreeTheGames Fund, created by OUYA to support developers making new and creative console games. OUYA will match your pledge dollar-for-dollar up to your goal amount (and a max of $250,000), so help us get there and make a great game for everyone! To be eligible for this match, we commit that this game will be an OUYA exclusive for a period of time. To learn more about OUYA, go to www.OUYA.tv. We are, and it will release SIMULTANEOUSLY! The Ouya FTGF exclusivity terms don't apply to computers. The rewards include DRM-free versions of the game for Windows, Mac, and Linux (distributed through the Humble Store) in addition to Ouya vouchers. It will include Steam keys as well if the game is accepted (please help by voting for us on greenlight). Alpha and beta access will be released simultaneously on all platforms. Name in credits - Your help is essential to making my nightmares a reality. To show our appreciation, we’ll put your name in the credits. Backer forum – We want to have a special place where we can discuss the game, nightmares, horror movies, game development, and more with you guys, so if you back the project with at least $5, you’ll get access to this. Digital game – Get a DRM-free digital copy of the game for Windows, Mac, Linux, distributed via the HumbleStore. The Ouya version will be released first with a voucher through the Ouya store. Beta access – Want to play versions of the game while it’s still in development? With beta access you can do just that! Alpha access - If you want to play early builds to watch things as they take shape in the game, get alpha access! Digital art book - The digital art book will include early sketches and concept art and show an evolution of the art style and the assets in game over time. Inner circle videos – If you think my current developer blogs are personal, wait until you see what I’ll share with the inner circle. I’m not comfortable sharing everything with the general public, but I am definitely interested in sharing more about my battle with mental illness and my life with those who are interested. That’s what the inner circle is for! Unreleased novel - Several years ago, I attempted to communicate what I was going through with my mental illness. I tried to write a semi-autobiographical novel called “Deconstruction”. After completing the first draft, my obsessive nagging voices discouraged me from continuing to work on it. (I’m not a real writer. It’s no good! And so on.) Since it is quite rough and I really am unsure of my writing skills, I'm not going to finish it. Instead, I think it would be more interesting if I annotated it and gave a "director’s commentary" explaining what I was trying to say, what I drew on from my own life, and other information to make it a more interesting read. If you are looking for more of a portrait into the mind of someone suffering for Obsessive Compulsive Disorder, I think this will be great for you. Physical copy of the game – Who doesn’t love having a collection of games on a shelf? Apparently it seems like lots of people, but personally I love it. If you are like me, then this is the reward for you! Poster – Do your walls feel naked and white? We’ll create an awesome poster for you to fill that empty space. Are your walls full? Try putting it on the ceiling! T-shirt – Everyone needs clothing, and what better to wear than a Neverending Nightmares shirt? Signed poster – With this reward, I will personally sign your poster and write a message to you. Physical art book – Wouldn’t you rather have a physical version of our beautiful art book? I know I would! With this reward, we'll give you a professionally printed book. A stylized portrait of you in the game + print – We have lots of paintings in the creepy mansion. In fact, we have so many that we can’t think of what to draw. Why don’t we make one of you, our backer? Our artists will draw a portrait of you in our art style and place it somewhere in the mansion. In addition, we'll print it out, so you can hang it on the wall of your own home. An actual painting of your in game portrait – Wouldn’t you rather hang a real piece of artwork on your wall than a poster? We’ll design the portrait, put it in game, and create an actual painting of it suitable for framing! Work with the team to incorporate elements of your nightmares - While I have plenty of ideas for horror in the game, do you have any really great ideas? If you get this reward, we’ll work with you to put them in the game! If you can't remember your nightmares, then work with us to design a monster or incorporate other scary elements you'd like to see in the game. Please note that we may have to veto some ideas or make adjustments to your ideas to fit them in the fiction of the game, but we want to work with you and come up with something cool. Create Sound Effects for the Game - Are you great at making scary noises? Do you want to contribute to the spooky soundscape of the game? With this tier, you can record something scary - a grunt, growl, or other noise, and our sound team will weave it into the aural tapestry of Neverending Nightmares. Name the male character – We’ve been calling the male character Adam, but I’ve never been really satisfied with that name. Do you have any good ideas? With this reward, you get to work with us to choose a name. We are definitely open to anything, but it has to work with the fiction of the game, so we reserve the right to veto something that we feel doesn’t match. Name the female character - The female character is referred to as Lydia, but I’m not too happy with it either. Work with the team to choose a better name for her! We reserve the right to pass on any name that we feel like doesn’t fit in with the setting of the game. Matt Gilgenbach has been developing games professionally for 10 years and has suffered from OCD and depression for longer. After working in the AAA game industry on titles like "Ratchet & Clank: Size Matters", he went indie 5 years ago in order to create Retro/Grade, which was well received but not financially successful. Now, he’s working with extremely talented developers to bring you “Neverending Nightmares”. Daniel Sass has almost 20 years of industry experience and was most recently Director of Engineering at THQ. He hired Matt Gilgenbach at his first industry job and is happy to resume working with him on “Neverending Nightmares”. Joe Grabowski was the principal artist on Retro/Grade and responsible for almost all the 3D models in the game. He is leading the art team for “Neverending Nightmares” as well as working on level design. Adam Grabowski did concept art for Retro/Grade and creates miniatures and masks of horrific monsters. He is working on level art for Neverending Nightmares. Adam is Joe’s brother, and they both graduated from Savannah College of Art and Design. Chris is an accomplished artist with a history of work on a variety of great looking mobile games. He did 2D art for Retro/Grade and is doing character design on Neverending Nightmares. Robin and Eduardo are responsible for creating the creepy sound effects. The sound design is in good hands because Robin designed the unique and terrifying audio only game “Deep Sea”. Skyler (AKA Nautilis) is the brilliant composer of the Retro/Grade soundtrack as well as the phenomenal albums “Sketches” and “Are You An Axolotl”. He has always wanted to work on a horror soundtrack and his enthusiasm shows with the amazing tunes he’s already put together for the game. We face the typical risks of all game projects. If you watched my postmortem of Retro/Grade (available in the GDC Vault), you'll know that the scope of the game got out of control. Many successful projects run into this problem, and we are taking several steps on Neverending Nightmares to stay on track. Creating great gameplay is a matter of trial and error, which is difficult to schedule, but we have allotted a large block of time for that. We learned a lot from the development of Retro/Grade and are planning on adopting different production techniques to keep the game in scope and complete it with the budget we have in the time we outline. We plan to have open development and keep our backers in the loop with the development process, so there will be no surprises! Creating a game that meets everyone's expectations is a challenging task - especially because everyone has different expectations for what the game will be. Even our expectations for the game right now are probably quite different than the finished project. This is the nature of game development and to lock in the design based on early decisions is dangerous for the quality of the game. We ask for your assistance to help shape the game, so we can deliver something you'll love. We know we can make this game happen and look forward to your help to do so! Thank you for your support! We will include your name in the credits. Get access to our exclusive backer forum where we will answer your questions about the game and seek your advice. We will post exclusive videos there as well. You also get your name in the credits! Get a copy of the game for PC, Mac, Linux, and Ouya! The Ouya version will be released first, and the PC/Mac/Linux versions will come later. You will get the $5 reward tier. If you missed the early bird tier, the game can still be yours! This includes the digital copy of the game and everything in the early bird tier. Get beta access to the game and experience the world of Neverending Nightmares before release. In addition, get a digital copy of the soundtrack by Skyler McGlothlin, the amazing composer on Retro/Grade, plus the $15 tier including the digital game. Get alpha access to the game in order to play the game early in development. Includes everything in the $25 tier. Get a digital art book showcasing the development process, and the inner circle developer diaries where I will talk about even more personal struggles. Get a digital ebook of the semi-autobiographical novel I wrote trying to illustrate what having OCD was like. This tier includes a physical copy of the game for PC, Mac, and Linux (plus a digital copy for Ouya). In addition, you'll get a t-shirt and poster. Get a copy of the poster signed by Matt Gilgenbach with a personalized message! Would you like to be memorialized in the game forever with your name on a tombstone? You can be! Includes the $150 reward tier. Get a full color, physical version of the art book plus all the $250 reward tier. Similar to the reward previously only available at the $1,500 level, you can help make a sound effect for the game. This version only includes the $350 tier. Our artists will draw a portrait of you in our art style and place it somewhere in the game! In addition, we'll create a high quality digital print of it, and send it to you. Plus everything in the $350 tier! Record a scary grunt, growl, or other noise, and our sound team will incorporate it into the game. Includes the $1000 tier. Are there any nightmares that haunted you that you feel like should be in the game? Work with the team to have elements from them incorporated in the game. Do you want to help design a monster? We'd love your help. This includes the $1,500 tier. Work with the team to choose a name for the tentatively named "Adam". We reserve veto rights to ensure it fits in the world. Work with the team to choose a name for the tentatively named "Lydia". We reserve veto rights to ensure it fits in the world.